What happens when Brooklyn meets North Dakota? Asian Scotch Eggs, Za'atar Monkey Bread, homemade tater tot topped hotdishes, and so many other gems found in this dazzling new cookbook by one of my all-time favorite food bloggers. Yeh's tasty recipes are accompanied by sumptuous photos, illustrations, and tales of her relocation told with her signature wit. Plus, three different recipes for Mac & Cheese--need I say more? Star of Food Network's Girl Meets Farm, and winner of the Judges' Choice IACP Cookbook Award, Molly Yeh explores home and family and celebrates her Jewish and Chinese heritage and her current Midwestern farm life in this cookbook featuring more than 120 recipes. In 2013, food blogger and classical musician Molly Yeh left Brooklyn to live on a farm on the North Dakota-Minnesota border, where her fiancé was a fifth-generation Norwegian-American sugar beet farmer. Like her award-winning blog My Name is Yeh, Molly on the Range chronicles her life through photos, new recipes, and hilarious stories from life in the city and on the farm. Molly’s story begins in the suburbs of Chicago in the 90s, when things like Lunchables and Dunkaroos were the objects of her affection; continues into her New York years, when Sunday mornings meant hangovers and bagels; and ends in her beloved new home, where she’s currently trying to master the art of the hotdish. Celebrating Molly's Jewish/Chinese background with recipes for Asian Scotch Eggs and Scallion Pancake Challah Bread and her new hometown Scandinavian recipes for Cardamom Vanilla Cake and Marzipan Mandel Bread, Molly on the Range will delight everyone, from longtime readers to those discovering her glorious writing and recipes for the first time. Molly Yeh can now be seen starring in Girl Meets Farm on Food Network, where she explores her Jewish and Chinese heritage and shares recipes developed on her Midwest farm. Molly Yeh is a baker, blogger, writer, and farmer living in East Grand Forks, North Dakota. She is the voice behind the wildly popular blog, My Name is Yeh, which has been the recipient of multiple awards, including two Saveur 2015 blog awards: Editor's Choice and Blog of the Year. Molly is also the star of Girl Meets Farm on Food Network, where she cooks recipes inspired by her Jewish and Chinese heritage and her life on a Midwestern sugar beet farm. Molly graduated from Juilliard and plays percussion in symphonies and orchestras around the world. She lives in North Dakota with her husband and their many chickens. "If you don’t look at the recipes and stories in this book and feel instantly happier, well, I don't believe you. This book is teeming with joy." "Funny and frank, Molly Yeh speaks for a new generation of cookbook authors. She charms us by laying bare both her cupboards and her vulnerabilities, and then wins us over completely with her innate confidence and joy in the kitchen. And with Funfetti Cake." "In life, things are generally interesting or gratifying. What we have here is a book that can do both. Like her homestead straddling state lines, Molly manages this woman-on-a-wire act not just in writing, but through comforting yet thought-provoking stories, regram-worthy photos, and some of the most delicious food I've ever made." "Molly on the Range, like its author, is quintessentially American: a jumble of influences and backstories, somehow adding up to a joyfully eclectic whole. Molly’s background as a musician is clear here: the rigors of technique are simultaneously celebrated and undone by practical interpretation: how am I going to make this work on this farm, right now, today?" "Molly Yeh's new book is a gem: her stories (charming, funny, whimsical) make you want to befriend her, her recipes (clever, unfussy, tempting) beckon you to the kitchen and when you finish reading it through (because this is one of those rare cookbooks you actually read), you wish there was more." "Molly and I both graduated from Juilliard and ended up shackled to stoves—a great testament to conservatory training. Her impeccable taste runs from Stravinsky to spätzle; I vouch for everything in Molly on the Range except for the deliciousness of marzipan. Marzipan is horrible." 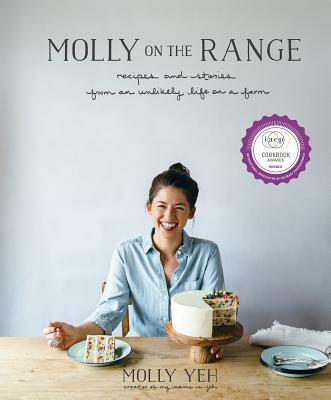 "Molly on the Range strikes the perfect balance between quirk and comfort food: the sorts of spins on classics you’ll want to use to make your friends think you’re fun and cool. I’m sure she comes from a different planet, but everything is cute and funny and tasty there, and you’re definitely invited, you just need a space suit. She's a relatable and endearing food-loving weirdo, and our plates are all the better for it."